Learn more about how we work and what we have been working on lately. A brief overview of some of the challenges we faced and how we overcame them when building a hot new WordPress powered website with eCommerce facilities from WooCommerce for Propex Leisure Accessories. We were delighted to be chosen by Propex Leisure Accessories to rebuild their eCommerce website. They offer spares, fittings and accessories for camper vans, motorhomes, caravans and boats. Their sister company Propex Heatsource specialise in air & water heaters and these accessories help people install from new or repair their existing vehicle heating systems. Propex are a particular favourite of the VW community. As long term VW fans ourselves; we built and owned a beach buggy, several air-cooled Beetles of various vintages, a lowered ‘Cal Look’ VW Fastback, today drive a VW Beetle Cabrio but last but not least, owning a VW split-screen camper is on our bucket list. Hence, we were very happy to work for a British company who are so well respected within the Volkswagen scene. Another factor that really made us happy to work for Propex was that they got eCommerce. They are experienced internet retailers and they ‘get’ the internet. This helps a lot. This made the project fun to work on, and cleared the path for us all to focus on our joint vision of creating a great website. The feedback we received was insightful, and thoughtful and helped steer us to creating the final product. Not that anything on the web should ever be finished totally, embracing that the web is fluid and that a website should always be evolving and hopefully always aligning behind the users goals is a fundamental of the world wide web. So have planned to continually refine and improve the user experience and make it even better in the future. 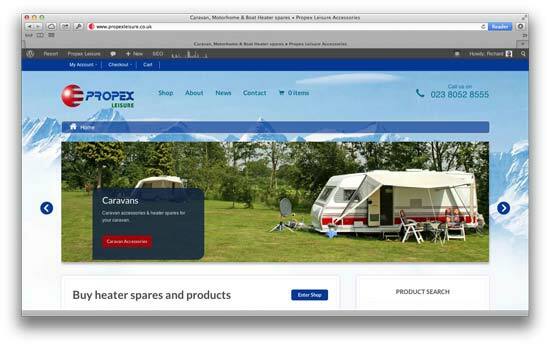 Imagining someone huddled inside a cold camper van trying to source spares using a phone was one of the personas we used to help develop the site. Having this clear vision helped us concentrate on the content. Using different background images to reflect the category the user is looking at helps them feel at home and also helps reinforce the fact that Propex offer quality products and solutions that are tailor made for their needs. From our initial discussions it became clear that the new Propex Leisure Accessories website would be a perfect fit for WordPress and WooCommerce, which are both open source applications. Version 2 of WooCommerce had just been released and offers an intuitive dashboard to manage orders, keep customers informed, manage inventory and stock levels. More importantly it is great for customers. Being open source software means that Propex did not need worry about licensing, which is always nice. Because their customers are always on the move, we wanted to make sure that the site worked well on mobile devices and in particular phones and tablets. Safety is always a priority for Propex. They were very keen to ensure that their customers can easily contact them via the telephone number positioned on every page of the website and also using the contact form. In fact their great customer support is one of the reasons why they are so well liked in the community. So we wanted to show this aspect of the company in particular. We created a testimonials feature so that people have got the opportunity to tell the world about how much they love their products and support. We also felt it important to allow customers to review the purchases too. So all products have a review and ratings system. It’s not just enough to build a pretty website though. We wanted it to be able to drive their Twitter, FaceBook and Google + accounts too. So all news posts will automatically feed into Twitter and FaceBook. Helping drive social media traffic to the website but also help their customers stay informed and engaged. We have also paid a lot of attention to SEO on the new site. This is never something you can just bolt on at the end of a project. With a clear content strategy from the start. Every item on the site be it a product, product image, product text and also the taxonomies used was carefully considered. All focused on the unique selling points of their products. Their products are known for their efficiency and reliability and we were particularly keen to show this off. We set up Google Analytics and configured the most excellent Yoast SEO plugin to work well for not only single product pages but also for the category and tag pages to try too specifically target potential Propex customers. Because of the dynamic nature of the website and in particular because it is an ecommerce shop we wanted regular scheduled backups of the website and database files. We tried out several backup solutions before choosing UpDraft Plus. A great plugin, making it a breeze to securely backup to the cloud. Hopefully we will never need these backups but at least we can all sleep well without worrying about having to complete the mind-numbingly dull task of manual backups. The website features a gallery to showcase some of the vehicles and installations they have done including their superb VW T5 heater demonstration machine. This has more gadgets than a Bond car. Even Q would be impressed with the remote controlled heater switches. No ejector seats though. We wanted customers to be able to search for products by SKU. Which is sadly lacking in Woocommerce. So we installed Matthew Lawson’s excellent plugin, which does exactly what it says on the tin. We came across a problem in testing with our payment gateway. Our order numbers which WooCommerce generated had previously been used in Propex’s old system. There was no easy workaround, so instead bought the Sequential Order Numbers Pro WooCommerce extension which gave us the ability to set the order numbers sequentially and avoid repeating old order numbers. Overall we are extremely happy with the end result. WordPress has just celebrated it’s tenth birthday and is continuing to get more polish on each iteration. Similarly WooCommerce has come of age with this release. The user experience is great both on the front end of the website and also behind the scenes. Most importantly Propex Leisure are pleased with the end result. They will be announcing a lot of new and exciting products in the next few months and they will now be able to easily add these to their new ecommerce platform. We are also privy to some other new developments in the Propex world, which unfortunately we can’t announce yet, but stay tuned, you will be hearing alot more about them over the coming months. Richard has been making websites since 1998. He likes web standards, HTML5, CSS3, Responsive Web Design and WordPress. When not hunched over his Mac you may find him cycling around the New Forest on his beloved Pashley Guv’nor, practising the art of attention seeking ( T’ai Chi) , plucking his guitar and running like a girl. iFamily are your Ringwood based web design company. We make websites for nice people like you. WordPress powers some of the world’s coolest websites, including this one. iFamily © 2013. All Rights Reserved.